Spitzoid lesions represent a challenging and controversial group of tumors, in terms of clinical recognition, biologic behavior and management strategies. Although Spitz nevi are considered benign tumors, their clinical and dermoscopic morphologic overlap with spitzoid melanoma renders the management of spitzoid-looking lesions particularly challenging. The controversy deepens because of the existence of tumors that cannot be safely histopathologically diagnosed as nevi or melanomas (atypical Spitz tumors-AST). Sentinel lymph node biopsy (SLNB) has been suggested as helpful strategy to predict the biology of AST, based on the assumption that the detection of melanocytic cells in the sentinel lymph node would predict an aggressive biologic behavior. However, it has been recently clarified that AST is associated with a highly favorable prognosis, even in case of SLNB positivity. Therefore, that the optimal management of AST is wide surgical excision, while SLNB should be considered inappropriate. From a morphologic point of view, a “spitzoid” pattern by definition presupposes a symmetric arrangement of colors and structures. Precisely the same dermoscopic structures represent melanoma-specific criteria if distributed asymmetrically. For example, asymmetrically distributed peripheral streaks, pseudopods or globules are considered features suggestive of melanoma. Pigmented Spitz nevi are dermoscopically typified either by a starburst pattern or by a globular pattern associated with reticular depigmentation. The starburst pattern represents a transitory phase in the morphologic evolution of a Spitz (Reed) nevus, since it will sooner or later turn into homogeneous or reticular pattern. In that phase, a Spitz (Reed) nevus cannot be recognized as such. Regularly distributed dotted vessels surrounded by white lines or areas (negative network/reticular depigmentation) represent the dermoscopic hallmark of non-pigmented Spitz nevus. In raised and nodular Spitz nevi the vessels might project as large red globules, coiled vessels or even hairpin or corkscrew vessels. The majority of AST are dermoscopically typified by a multicomponent pattern and are, therefore, dermoscopically similar to melanoma. However, a proportion of AST might display regularly distributed dotted vessels with or without reticular depigmentation, mimicking a non-pigmented Spitz nevus. Spitzoid melanoma is usually characterized by an asymmetric distribution of spitzoid features (streaks, globules, vascular structures), often combined among them to form the so-called multicomponent pattern. However, less frequently, melanoma might perfectly mimic a pigmented or non-pigmented Spitz naevus. The probability of a dermoscopically symmetric spitzoid-looking lesion to be a melanoma depends on the patient’s age: It is extremely low before puberty and gradually increases afterwards, being equal to 50% after the age of 50 years. Lesions displaying spitzoid features (peripheral streaks/pseudopods, dotted vessels, reticular depigmentation) asymmetrically distributed should be excised to rule out melanoma. All the aforementioned features, when not symmetrically distributed, should be considered as criteria suggestive of melanoma. Dermoscopically symmetric spitzoid-looking lesions developing after the age of 12 years should also be managed with caution since, as mentioned above, such a lesion has a considerable probability to be a melanoma. The recommended management is excision. 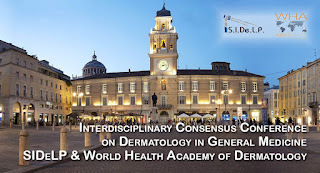 Below the age of 12, the recommended management of dermoscopically symmetric nodular spitzoid-looking lesions is excision, mainly because the possibility of AST cannot be excluded on the basis of dermoscopic morphology. Follow up until stabilization represents n acceptable alternative option. Below the age of 12, the recommended management of dermoscopically symmetric flat/raised spitzoid-looking lesions is follow up until stabilization. However, clinicians should take into consideration that Spitz nevi are highly dynamic lesions and following up their morphologic evolution sometimes will increase anxiety instead of reducing it and lead to unnecessary excisions.